12/28/10: Updated with new photos — scroll down to view! 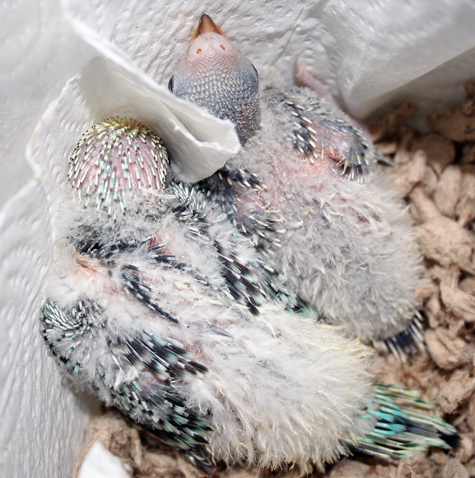 11/20: These Budgie Parakeets are two weeks old. We’ll be hand-feeding them through December. Top 3 chicks are out of Hydrangea x Sunny. Lower chick is out of Cloudy Too x Sunshine. The remaining babies will be pulled from the nest boxes and photographed as they turn 2 weeks of age. 11/25: Added two chicks from Hydrangea x Sunny to the brooder for hand-feeding. 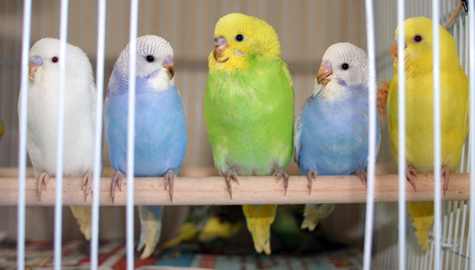 Top left is a light green opaline spangle; far right is a blue opaline spangle. 11/27: Added the two chicks from Lilac x Shrek (lower right) to our brooder for hand-feeding. 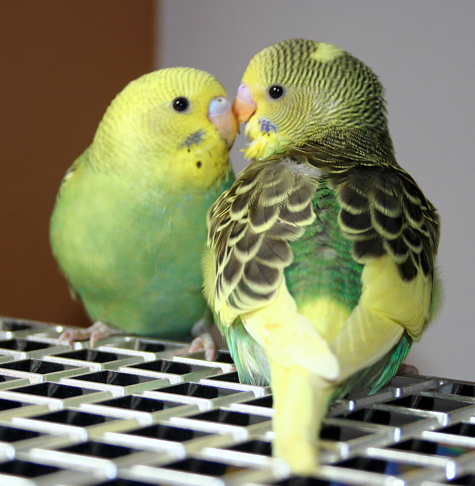 The male is a yellow and green pied and the female is a green opaline. The remaining two (from Rainbow x Navaho) will be added to the group in a week. 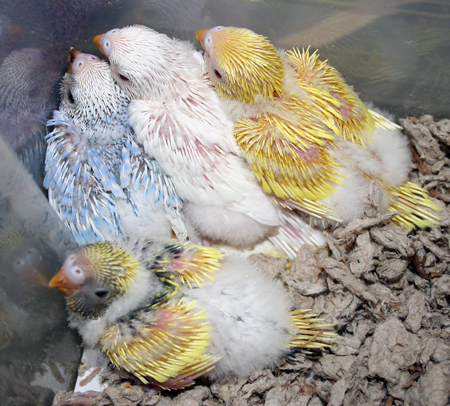 12/5: Rainbow x Navaho chicks moved into brooder. 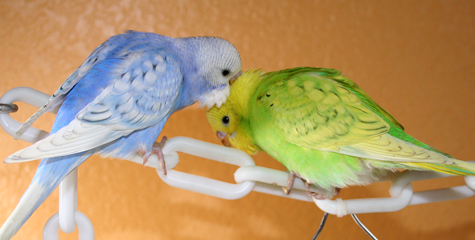 The one on the left is a yellowface type 2 skyblue opaline female; the one on the right is a yellowface type 1 cobalt. 12/5: 5 chicks from Sunny x Hydrangea during fourth week. 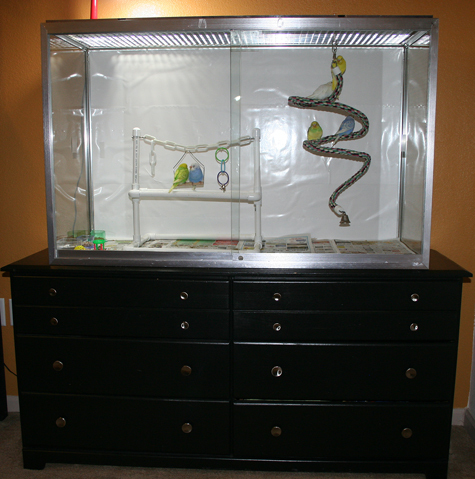 Moved from brooder into nursery cage. Starting to nibble sprouted seeds. 12/5: Violet-blue opaline spangle (front) from Hydrangea x Sunny at 4.5 weeks. 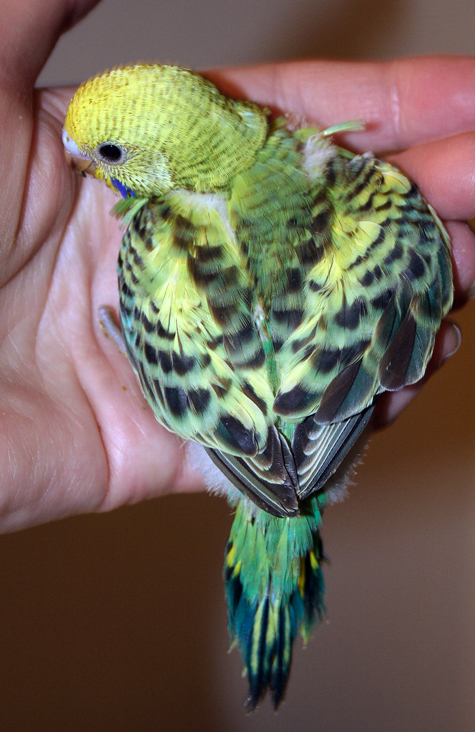 12/6: Opaline dark green (or violet-green) female from Lilac x Shrek at 2.5 weeks. 12/6: Light green opaline spangle from Hydrangea x Sunny at 4 weeks. 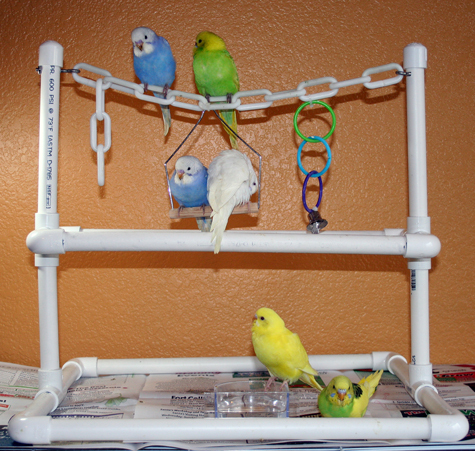 12/7: The older parakeets are now taking their first awkward flights around my office and exploring the playgyms. 12/7: The violet-blue spangle is preening the feathers the green spangle can’t reach. 12/11: The oldest chicks have graduated from the nursery cage to this large open flight aviary. They receive 12 hours a day of full-spectrum light to aid calcium absorption and vision development. Lots of room to fly and play! 12/11: They eagerly fly to my hand when the aviary doors are opened. 12/14: These chicks are 3-4 weeks old and almost ready to move out of the heated brooder and into the nursery cage. We are hand-feeding them 4 times a day, plus they are starting to nibble on our sprouted mix and millet sprays. 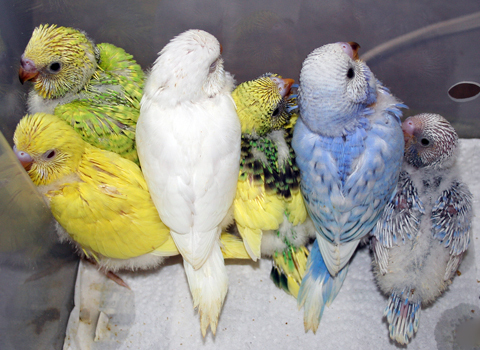 From left to right: yellowface type 2 skyblue opaline female, violet-green and yellow opaline female, yellowface type 1 cobalt male, green and yellow pied male. 12/16: Little butterballs! We moved Lilac x Shrek’s chicks into the nursery cage. Their dad, Shrek, is one of the favorites here because of his excellent personality and talking ability. We are hopeful that his chicks will inherit his charm! 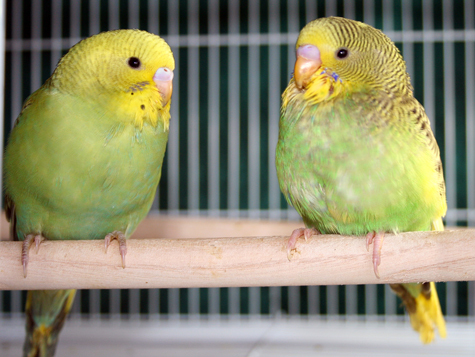 Left: Female opaline dark-green or violet-green. 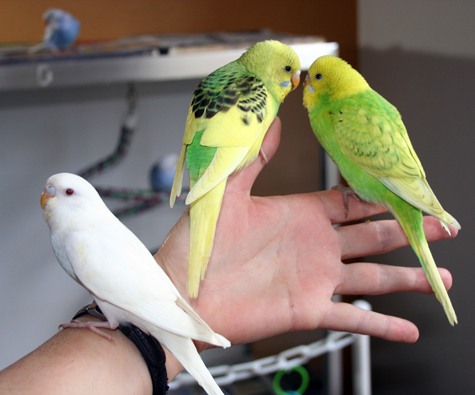 Right: Male green and yellow dominant pied. “What, me, a klutz? Nah, I did this on purpose. 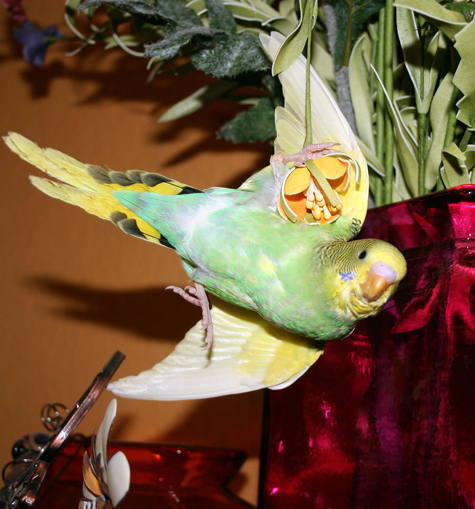 I’m just stopping to smell the flowers.” 12/17: Lilac x Shrek’s boy takes his first flight around the room. The first landing is never very graceful but he managed to do it in style. 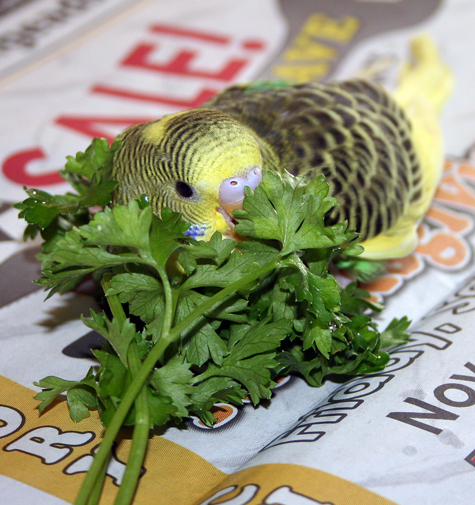 “Peekaboo!” 12/17: Lilac x Shrek’s boy again, playing with parsley. Wish I had captured the bath he took on it when it was wet! 12/17: Lilac x Shrek’s kids sharing a sweet sibling moment. 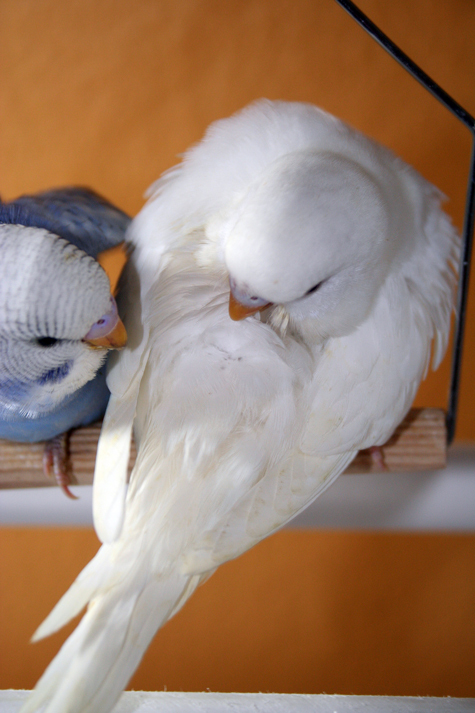 The opaline girl is on the left, pied boy on right. 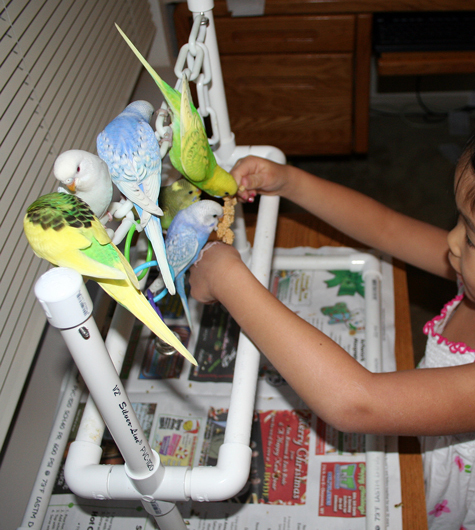 12/17: My 5 yr old daughter does an excellent job of training and socializing the chicks. 12/17: My daughter’s hands are too small to feed the babies with the formula syringe, but they’re just right for feeding millet sprays. 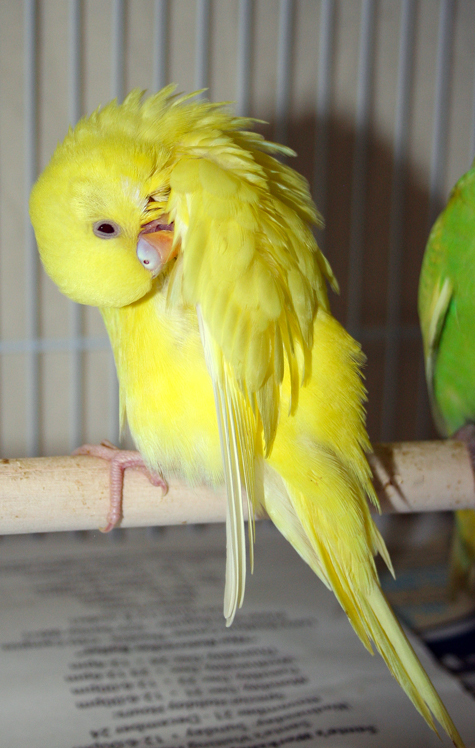 12/19: Yellowface type 2 skyblue opaline female from Rainbow x Navaho at 4.5 weeks of age. 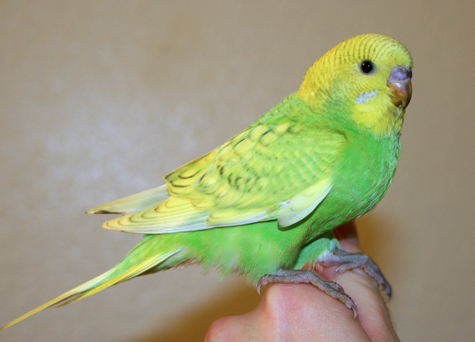 12/19: Yellowface type 2 skyblue opaline female from Rainbow x Navaho at 4.5 weeks of age. 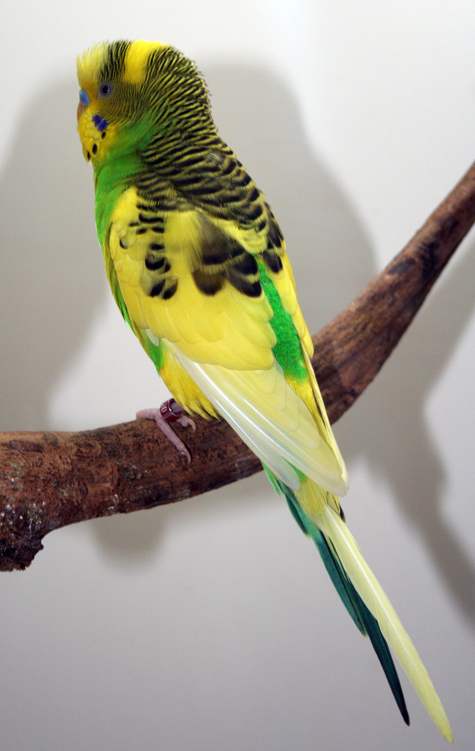 The yellowface type 2 mutation spreads the yellow through the blue body color and turns it turquoise. The color will intensify after she molts and grows adult feathers. 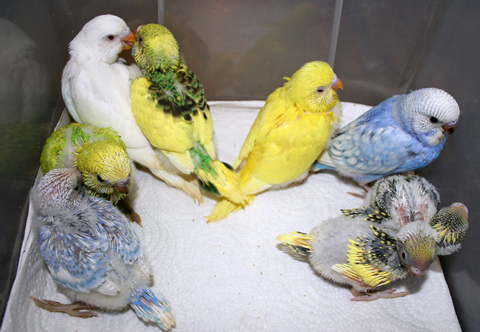 12/27: Dark green (or violet green) opaline female from Lilac x Shrek at 6 weeks of age; Yellowface type 1 cobalt male from Rainbow x Navaho at 5 weeks of age, “Pluto”. To be added to our waiting list for upcoming chicks, please send us your completed pre-adoption questionnaire. 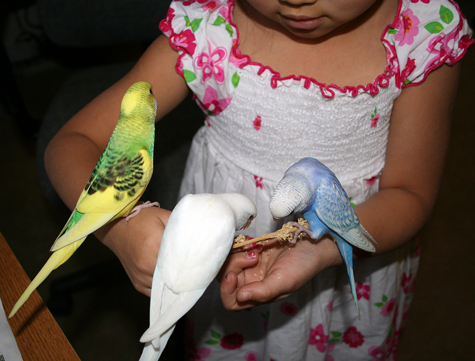 Mom to 5 chicks: “Hydrangea”, female opaline single-factor-violet-skyblue greywing American parakeet and Dad, “Sunny”, male DF spangle English budgie. Baby #1: Albino SF spangle female English x American. Split: greywing. 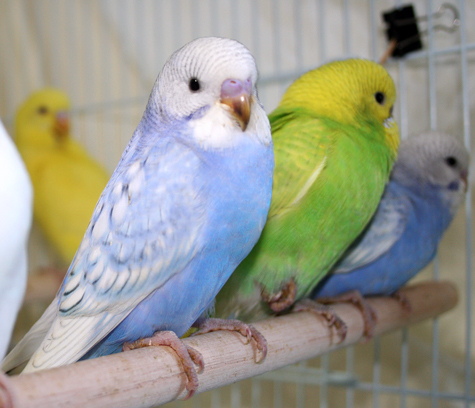 Possible (hidden by albino color): opaline, single-factor violet. Reserved for Kelly W from Colorado Springs, CO.
Baby #2: Lutino SF spangle female English x American. Split: greywing, blue. Possible (hidden by lutino color): opaline, single-factor violet. 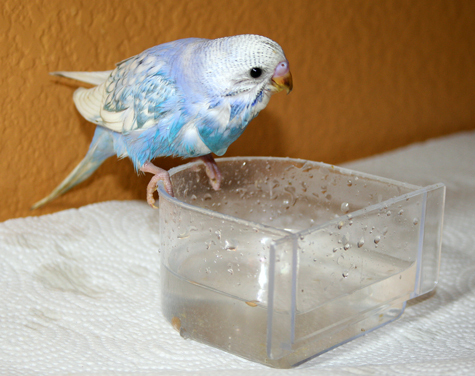 Adopted by Marie R from Estes Park, CO.
Baby #3: Violet-blue opaline SF spangle male English x American. Split: greywing. Jen, the breeder, is keeping this one. 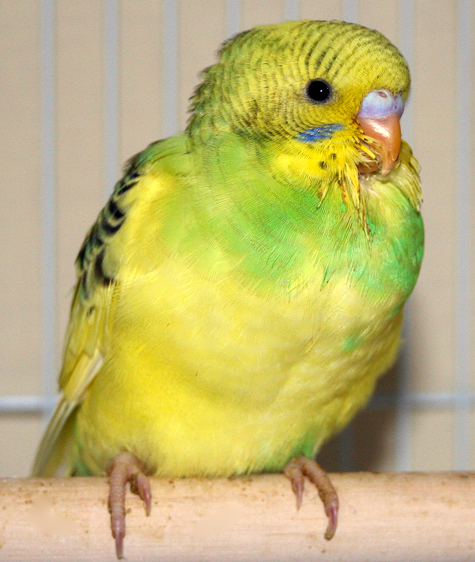 Baby #4: Light-green opaline SF spangle male English x American. Split: greywing, blue. Possible: single-factor violet. Jen, the breeder, is keeping this one. 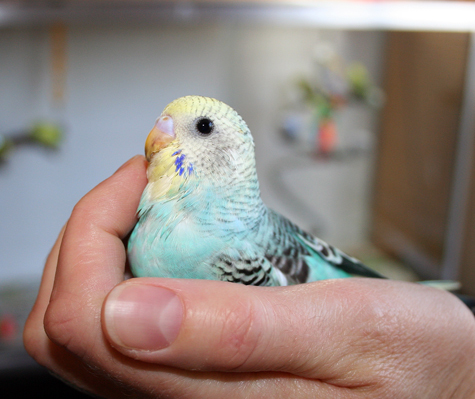 Baby #5: Violet-blue opaline SF spangle male English x American. Split: greywing. Jen, the breeder, is keeping this one. Note: ~50% will be SF violet. ~50% of males will be split for Ino. 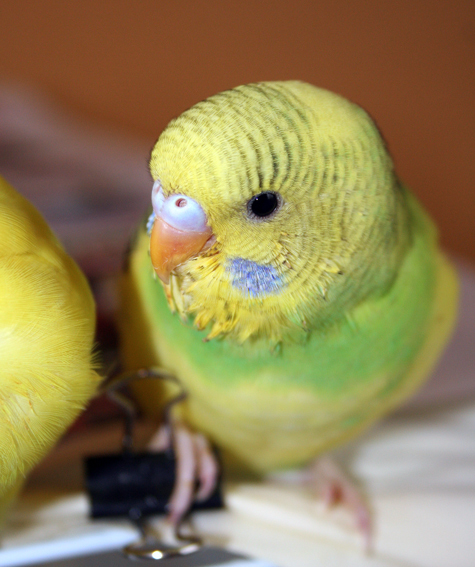 Baby #1: Light-green and yellow opaline dominant pied female American. 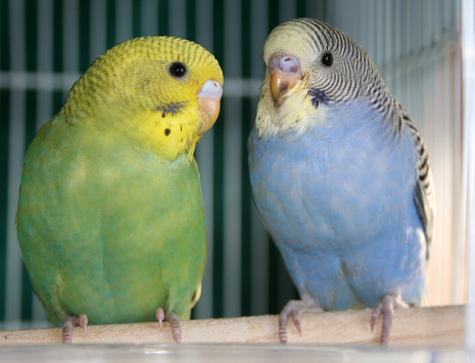 Split: recessive-pied, blue. Adopted by Barbara B. from Nebraska. 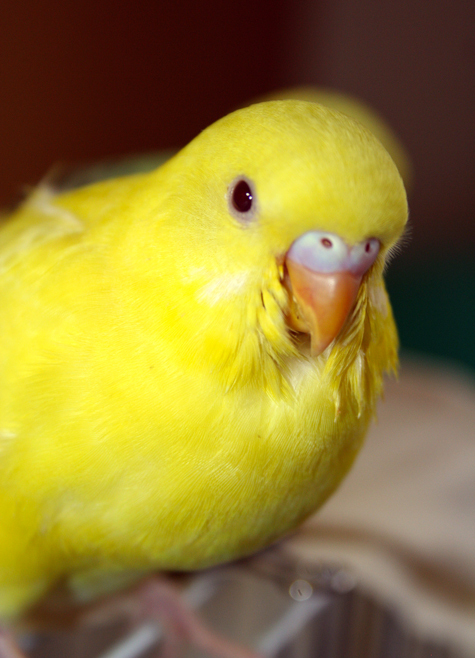 Baby #2 “Pluto”: Yellowface type 1 cobalt American. Possible: single-factor violet. Split: opaline. Jen, the breeder, is keeping this one. 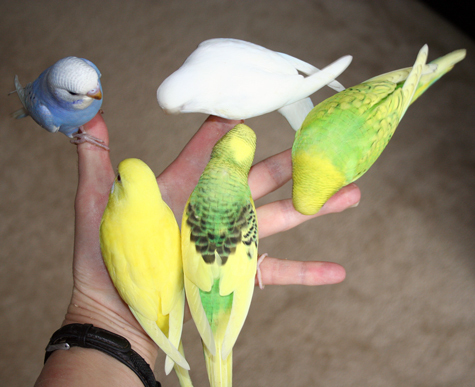 budgies in the near future.